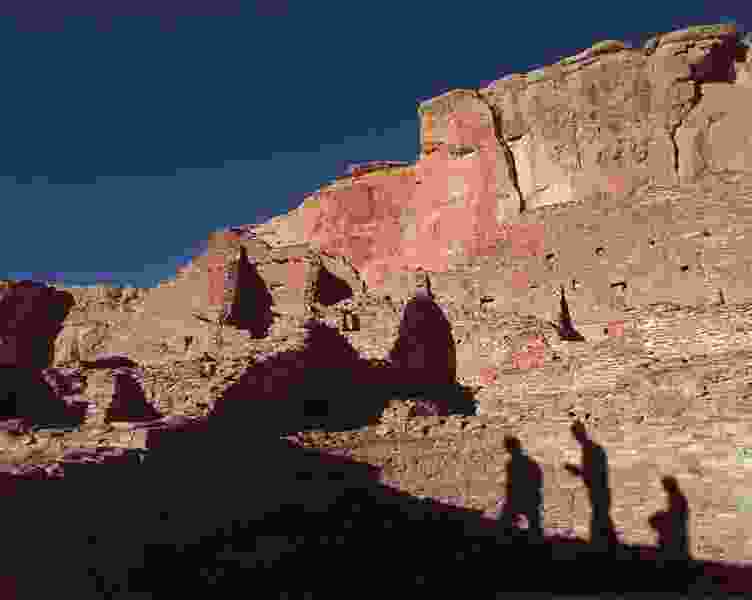 (Eric Draper | Associated Press file photo) In this Nov. 21, 1996, photo, tourists cast their shadows on the ancient Anasazi ruins of Chaco Culture National Historical Park in New Mexico. Advocates for greater restrictions on oil and natural gas drilling near ancient Native American cultural sites in the Southwest are urging Congress to establish new precautions. A congressional subcommittee on energy ventured thousands of miles from Washington to hold a field hearing Monday, April 15, 2019, on the impacts of air pollution on sacred ruins and landmarks. New Mexico's delegation to Washington wants to halt new drilling leases near Chaco Culture National Historic Park. Santa Fe, N.M. • Leaders of the Navajo Nation and Pueblo tribes expressed frustration Monday with federal oversight of oil and gas leases on public holdings near ancient American Indian cultural sites and endorsed legislation to restrict natural gas development around Chaco Culture National Historical Park. Lawmakers including U.S. Rep. Raul Grijalva of Arizona and New Mexico’s Debra Haaland and Ben Ray Luján said they were profoundly moved by a visit Sunday to ancient Chaco dwellings and nearby industrial sites, where they used infrared camera technology to view methane escaping into the atmosphere. Grijalva said Chaco Canyon deserves the same consideration for protections as Yellowstone National Park, which received an ecological buffer under legislation signed this year by President Donald Trump.